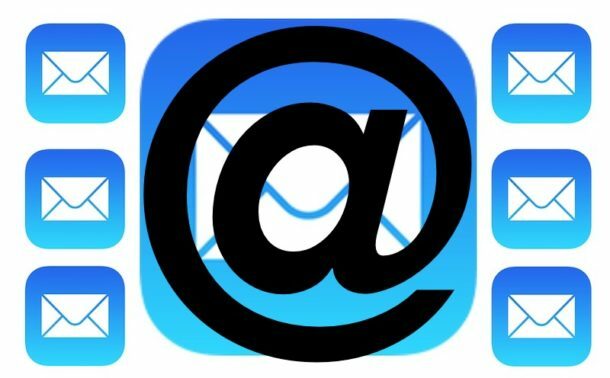 For iPhone and iPad users with multiple email accounts in iOS Mail, you may want to change the “From” address when sending a specific email. This does exactly what it sounds like; it changes the email address you are sending an email from, but rather than changing the setting universally to set a new default, you can adjust the sent from address on an individual email basis. 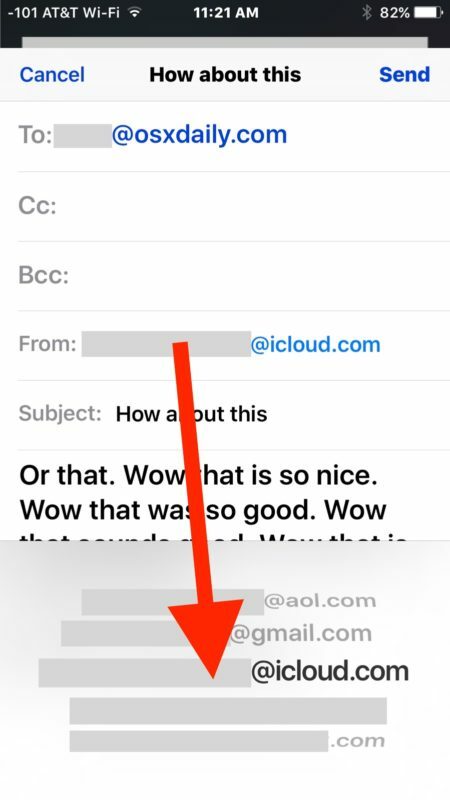 It’s quite easy to switch the sent ‘From’ email address in particular emails on iOS, but it’s not entirely obvious until you’re shown how it works. You will need at least two email accounts setup in Mail app to have this ability in Mail composition screens, you can add a new email account to iOS at anytime using third party services like gmail, hotmail, outlook, yahoo, aol, or create a new iCloud.com email address if you want. Compose and send the email as usual and it will be sent to the recipient using the email address chosen. You can send any kind of email from any email address account setup in Mail app, all you’re doing here is changing what email account you are sending the message from. 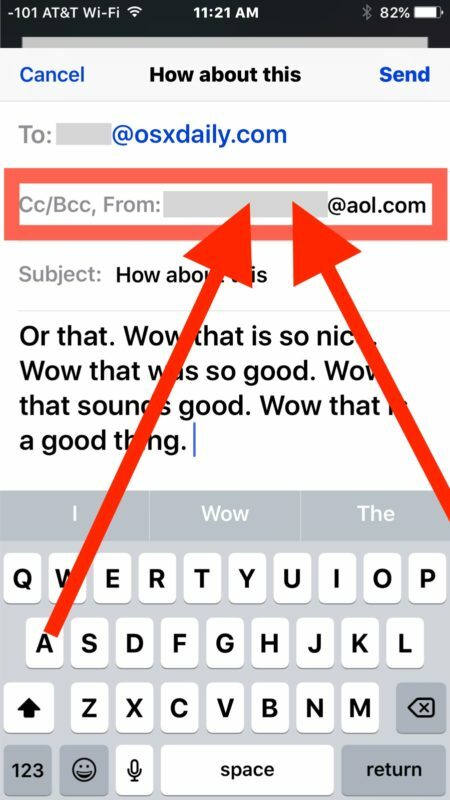 This is something worth paying attention to if you recently added a new email account to iOS or generally juggle multiple email accounts on an iPhone and have them setup in the Mail app, since you probably don’t want to accidentally send an email from the wrong address (which happens fairly easily). For those who do use multiple email accounts in Mail app, it’s a good idea to set the default email address on iPhone and iPad to the one you wish to use as your default, which is usually whatever you use most often on that device. So for example if it’s a personal device, have your personal email be the default. Then you can always use the above tip to adjust the “From” email address at any time if you do want to send a quick email from your work account or another personal account. I would LOVE to learn how to change the “From” email on my Mac computers. I changed it to something that I dont want, and no way to change it back. Just want ‘Jane’ to be put on my outgoing email. A friend had me change it to ‘undisclosed recipient’ and I do not want that. But he couldn’t teach me how to change it back to Jane. Are people really becoming this stupid that they cannot figure out this on their own? IMO yet another in a long, long line of useless posts on OSXDaily. The fact that you find it easy to blast someone that you know nothing about, is sad. You need to grow up and move on to other things. Stop visiting the site if you are not happy with the content. Right back at ya, Art, you can stop reading anytime. AFA what and where I post, this is a public site, anyone is welcome to comment. I suggest if you cannot handle what the opinion of others is, you stop reading open forum postings. What about “From” looks like a button in Mail? How would you know to tap that in an email composition window for changing your email address? Why not tap the “To” or the other options, which do nothing because despite looking the same as “from” they are not button. Nothing in iOS looks like buttons anymore, the redesign is still a UI/UX mess. Try seeing a novice tech user interact with an iPhone or iPad today… it’s clear the company did not test any of this before releasing it. Regardless if you don’t like a tip, then don’t read it. If you know everything, you don’t need advice for iPhone, iPad, email, etc, right? If you can’t stop whining then just stfu. Of course apple users can’t figure this basic stuff out on their own – that’s why they are apple users. As for the ‘from’ email on a per-email basis, it is similar to iOS and you click on the From field to reveal all addresses setup on that Mac in Mail app. I find these very basic tips the most helpful of all! I’m not a “heavy user” and often just forget. Please continue to post the entire range of tips. If as a subscriber ( to this free site!) it is already something you know just pat yourself on the back. We aren’t all as knowledgeable! *NB. Not everyone is from North America, I’m Australian and would appreciate you stating US$ &/or being more inclusive of a wider community outside of North America. Changing the sent from email address is universal in iOS it does not matter what country you are located in, you can change it anywhere as long as you have multiple email accounts. Doesn’t matter the nation or the email server provider too. I’m wondering if it’s possible to set up an existing mail account in iOS, but not have it download messages, so when replying to email, you have the option to select that address to Send from. I have 4 email addresses on my iPhone 6s. When replying or forwarding emails from my iPhone I do not have the option of changing ‘from’ address. How can I change this such that I can choose what email address the reply or forward is sent from?